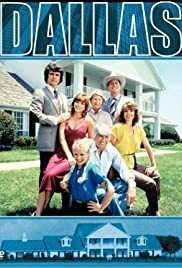 show started on CBS in the spring of 1978, the show centered around the "Romeo & Juliet" love story of Bobby Ewing (Patrick Duffy) and Pamela Barnes Ewing (Victoria Principal), the daughter of the Ewings' arch enemy Digger Barnes. Story lines, and ratings. changed for the better when DALLAS refocused on the devilish dealings of Bobby's oldest brother John Ross "JR" Ewing, Jr. (Larry Hagman. DALLAS reached the peak of its' popularity when JR was shot in the spring of 1980. For years, the show would remain at the top of the ratings until it started getting competition first from ABC's "Dynasty" and then NBC's "The Cosby Show". DALLAS' ratings was never the same after 1986 when Pam dreamed the entire 1985-1986 season. The show ran until 1991, when low ratings virtually killed it. It also spun off the longest-running prime-time soap ever, KNOTS LANDING.